Jan Lewis, Accounting Clerk in the Finance Division, has been actively involved with helping those affected by autism since 2004. "In 2004, my son was three years old, and with the help of early intervention, he was diagnosed as autistic," she says. "I was frozen with fear of the unknown. I had no idea what autism was or what it meant to my beautiful, perfect child." ﻿With the help of a pediatrician, a neurologist and the organization Autism Speaks, Lewis learned enough to not only help her son but to also begin the journey toward finding a cure. The journey started about ten years ago when she heard about Angel's Wings, a nonprofit organization in Trenton, N.J. Lewis was there when the first baby arrived at the 30-day emergency respite care facility for newborns and children up to age 12 who come from the N.J. Division of Youth and Family Services (DYFS). "I started volunteering for four-hour shifts on the weekends, but was often there more frequently taking care of these incredible children. It's an amazing experience to care for and comfort several children after a long, exhausting workweek." Soon, Lewis was taking foster-parent training. "A few months later a three-month-old was brought to Angel's Wings crying his heart out. My heart broke. My first son came home with me a month later, and his younger brother joined us about 18 months after that. 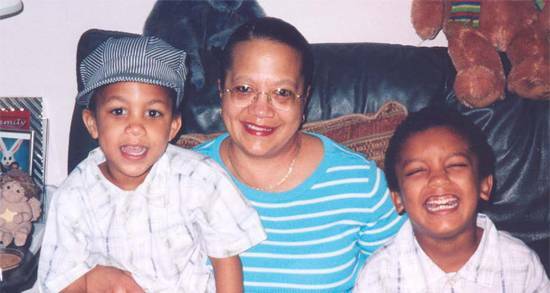 "Through my research, I was learning the steps I needed to take to help my oldest son. What I learned helped me to recognize early signs of autism in my youngest son." Lewis's adopted sons are now seven and nine years old. "They were receiving limited services in the public schools, so I used what I had learned to fight for the services they needed and rightly deserved. They have since been placed out of the district and into a private school that can better meet their special needs." But Lewis was determined to do more. She wanted to make a difference by helping other families and helping to find a cure. "I wanted to do it for my sons, and I wanted to do it for the many individuals and family members who were living with autism every day." In 2001, ETS recognized Lewis with its first ETS Volunteer of the Year Award for the time, energy and dedication she had given to the children of Angel's Wings. 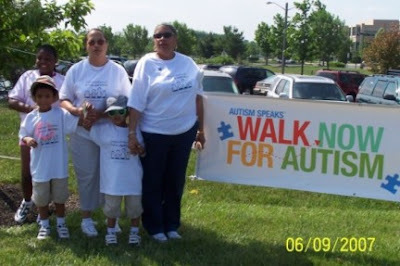 In 2007 Lewis became actively involved with Autism Speaks and participated in her first "Walk Now for Autism Speaks" event. Autism Speaks is the nation's largest autism science and advocacy organization, dedicated to funding research on the causes, prevention, treatments and a cure for autism; increasing awareness of autism spectrum disorders; and advocating for the needs of individuals with autism and their families. Last April, during Autism Awareness Month, Lewis worked with the ETS Social Investment Fund to bring autism information and awareness to an ETS lunch-and-learn session. On October 10, Lewis participated in the Walk Now for Autism Speaks event on the campus of Mercer County Community College, where she was accepted as a V.I.P. member of Autism Speaks 2010 Grand Club for raising over $1,000. "Through the many generous donations made by ETS employees, family and friends, I raised $1,200 that will fund research to find a cure. I will continue to support Autism Speaks in any way that I can. I will continue to have discussions about autism with anyone who cares to engage in a conversation. "The fight for services that will help my sons with their daily struggles has been a battle that will undoubtedly last for the rest of my life and theirs — but I will continue to fight, because I have to." Autism is a general term used to describe a group of complex developmental brain disorders known as Pervasive Developmental Disorders (PDD). Some other pervasive developmental disorders include Asperger's Syndrome, Rett Syndrome and Childhood Disintegrative Disorder, often referred to as Autism Spectrum Disorders. Learn more about autism by visiting the Autism Speaks website.